Live Art is a pop-up-- a new art, music, prose and music genre structured like a magazine, with front-matter, features, and interstitial delights. It’s editor-in-chief, the artist and photographer Amanda Herman, with much help from her friends, stages a fast-moving series of short, 2 minute pieces, a few six or eight minute main articles, and a string of surprises--like a magazine’s cartoons and verse and pensive reflections and memoir. The performers are local and regional -- writers, poets, artists, musicians, dancers, filmmakers--risk-takers all. For the fourth year, we ‘publish’ their new work and work-in-progress on the stage. HERE’S A SNEAK PEEK OF OUR: the hip-hop dancers of Hartford's Studio 860; a collaboration between drummer Chris Corsano and sound artist Jake Meginsky, a tale from NEPR’s 2015 Story Slam winner Susanne Schmidt, a political reflection from journalist Shaheen Pasha, a magical animation by Jo Dery, an ironic dispatch from radio producer Karen Werner, gripping videos in progress from the artist collective Tristatic, and stomping music by our audience’s standing-o favorite, Sci Tech High School Band, who’ll come up from Springfield in two school busses, with another full of tubas, coronets and glockenspiels. Live Art is a one-night-only event. We promise our artists no one will record or film their work, and in return, they share evolving experiments, with no worry about copyright. We’re after immediacy in a world given over to digital perpetuity. The magazine’s editorial mission is offering quality, daring, notional experiences close to the raw nerves of formation. The pop-up is a new form. It has spread from coast to coast and through Europe, a 21st century anomaly, at odds with though enfolding the digital revolution. It happens ephemerally and only for you. The evening is fast paced and textured, a mix of contemplation, wit, visceral visuals, and stomping rhythms. There’s no host--instead, we structure playfully in run-throughs. The Magazine’s sections include readings (poetry, fiction, essay), performances (music, dance, theater), film, and this year, some radio. Short work begins the evening. Features dig deeper. And the band plays on. THERE’S A PRE-PARTY . . . from 6-7 p.m., right in the lobby of the Academy, with local beer and cider, live music, projected art and your creative and political allies gathering. To attend the party, just request an invitation on the website in advance, when you buy your tickets. THE SHOW ITSELF starts at 7:30 p.m.. It runs an hour-and-a-half. No intermission. 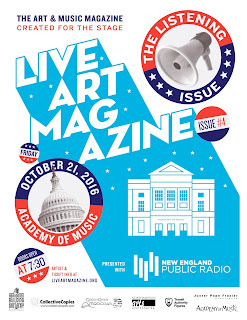 The show grows from a nifty creative partnership between Live Art Magazine and New England Public Radio. 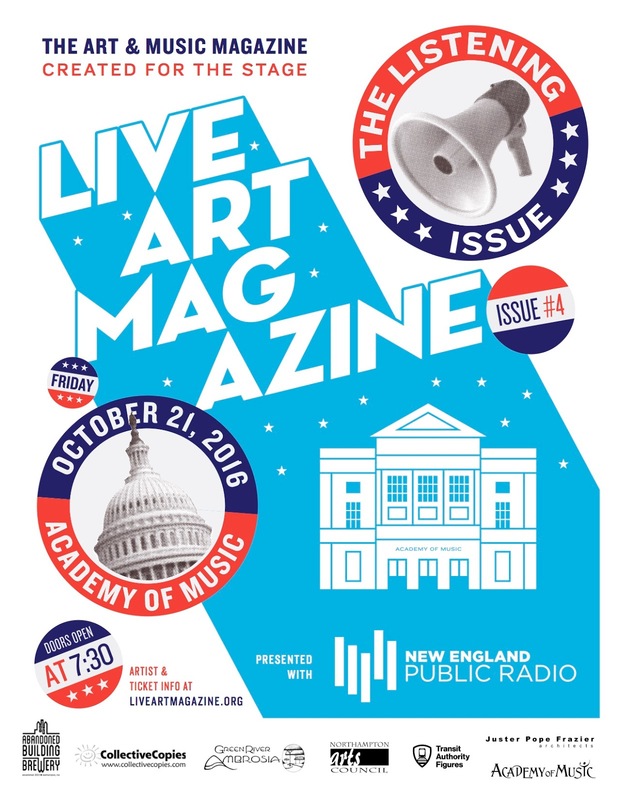 NEPR releases three “Live Art Magazine” podcasts on our feature performers and their artistic processes--but to experience NON-DIGITAL show itself, you’ve got to come. Join us!